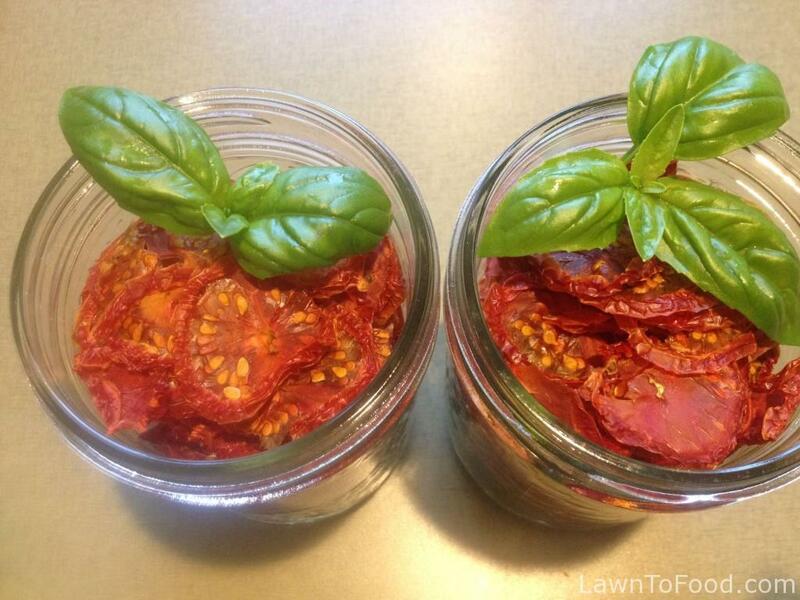 Dried Tomatoes are so tasty and easy to preserve. I dehydrate many trays full every summer and store them in air-tight containers. Adding herbs, garlic and a quality oil make outstanding “Sun-Dried Tomatoes” which are one of my favourite things to use in the kitchen. I love to have a jar, or two, in the fridge to use for pizza toppings, salad dressings, or to add a burst of flavour to sauces and salsa. Even just a drizzle of jar oil, can add a boost to any raw vegetable salad. I start with some ripe tomatoes from our organic garden. 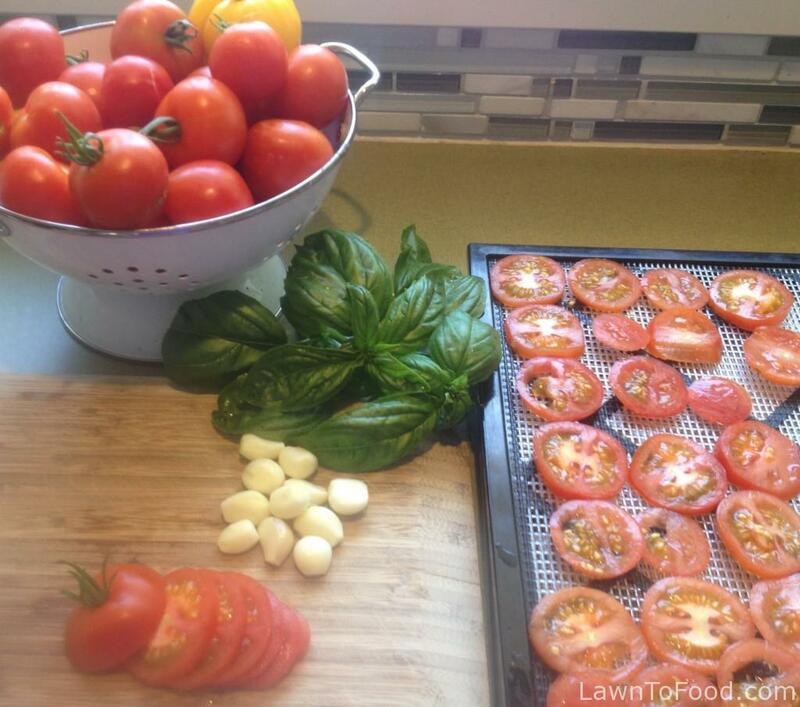 I think that Roma tomatoes are the best for dehydrating because they have a firm texture and less water content. However, I dry all types of tomatoes. I pick whatever is ripe and in need of preserving. For this batch, I am drying Ailsa Craig tomatoes that are a lovely 2″ in diameter size and very sweet to taste. 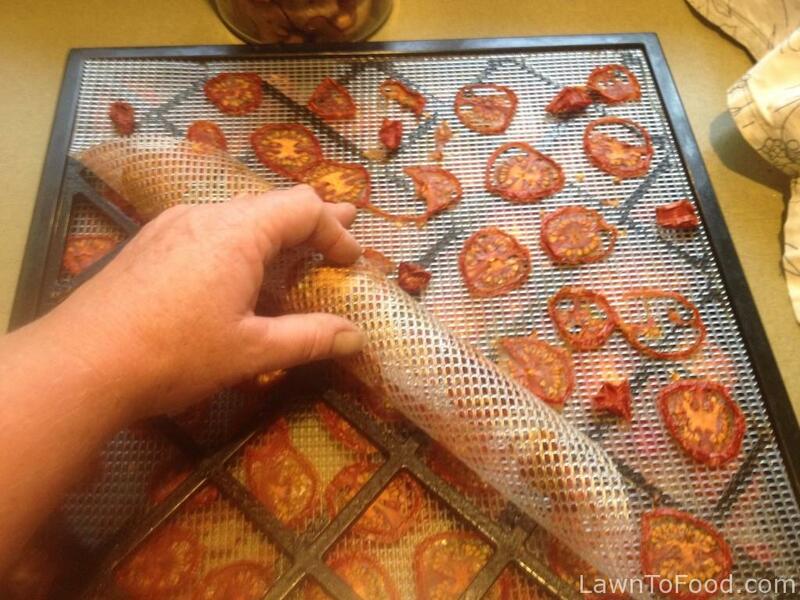 I simply slice the tomatoes in even thicknesses and lay them out on my mesh drying sheets. I don’t de-seed or de-skin my tomatoes before drying. You could use silicone dehydrator sheets but I have found that it takes much longer to dry the tomatoes with the solid sheets compared to the mesh, which allows for a lot of air flow. After the tomatoes are dry, I store them in air tight containers or make jars of Sun-Dried Tomatoes to keep in the fridge. I start with sterile jars and have all the ingredients ready to use. 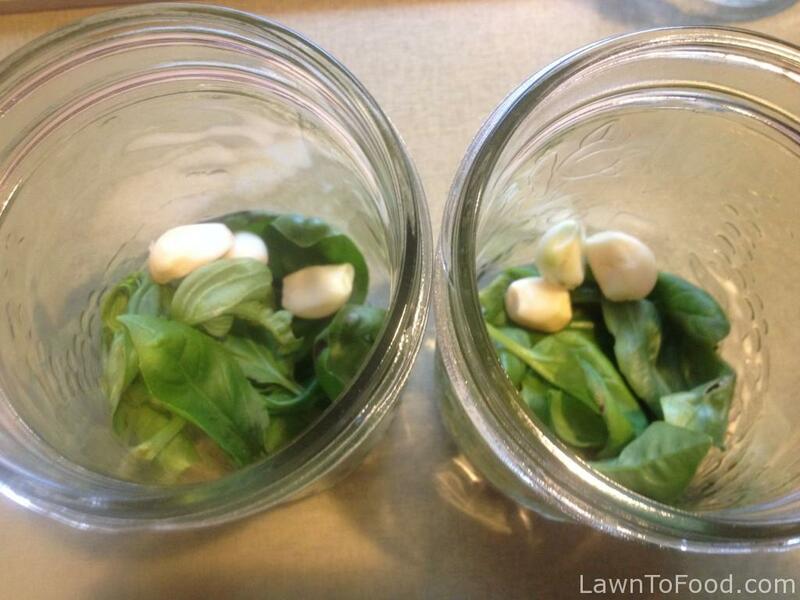 I peel some of our garden garlic, pick and wash fresh basil (plus oregano and thyme if desired) and get ready to remove the dried tomatoes from the dehydrator sheets. Wow they really shrink don’t they! If the dried tomatoes don’t peel away easily from the mesh sheet, then just roll the sheet up, which unlocks them from the surface. I layer a handful of basil (plus other herbs if desired) and at least 3 garlic cloves into the bottom of each wide mouth pint (500ml) jar. 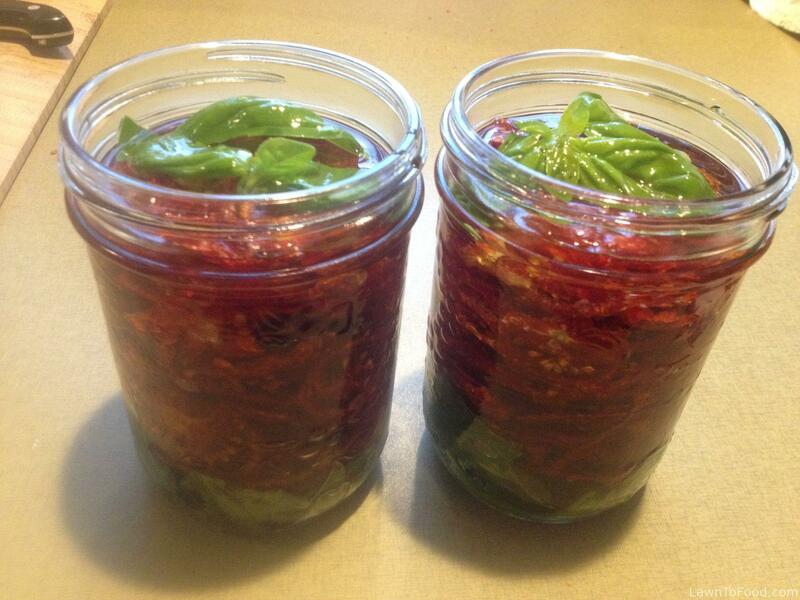 I find that it takes 2 full dehydrator trays of dried tomatoes to fill one jar. 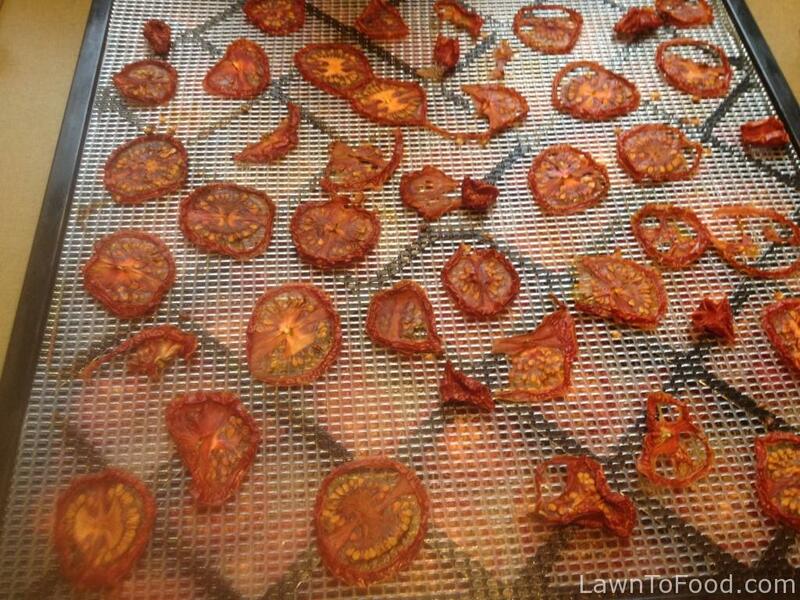 The dehydrator trays clean up easily if you let them soak in warm water for about 15 minutes. I leave at least an inch of space open at the top of the jar. At this point I add 1 TB of balsamic vinegar, 1 tsp of salt and then fill each jar with great quality extra virgin olive oil. It takes a lot of oil to fill each jar, so be prepared by having enough on hand. These filled jars are ready for lids. At this point you could use a pressure canner to seal the snap lids for a long shelf life. I tend to only make 2 jars at a time. I keep them on the kitchen counter for 24 hours (to soak) and then store them in the fridge. 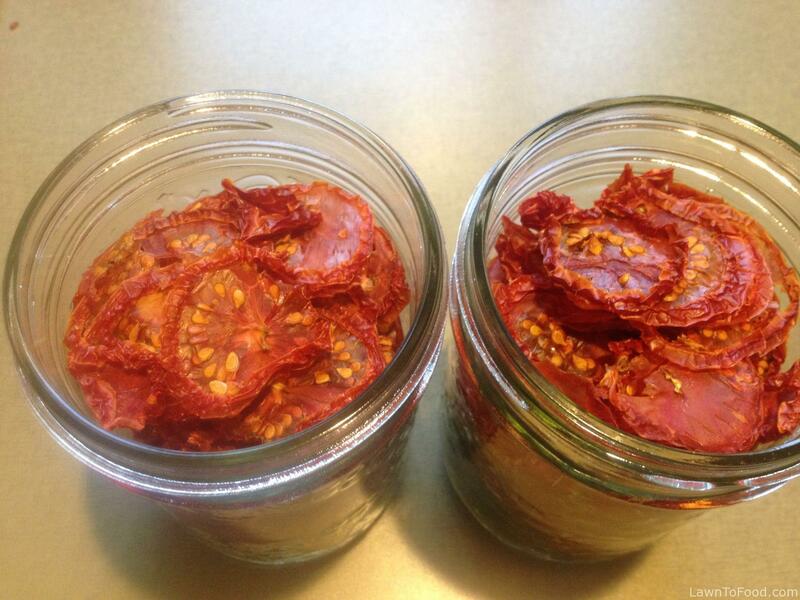 It takes about a week for the herbs & garlic to bring the dried tomatoes into greatness. If I start running low on Sun-Dried Tomatoes, I take more dried tomatoes from the pantry and make another jar full of herbs, garlic and oil. The oil is spectacular in all kinds of applications from salad dressings to keeping your morning omelette from sticking. This entry was posted in Let's Eat, Preserving & Using Preserves, Reep the Harvest by Lynda. Bookmark the permalink. Thanks for another great post Lynda!! We will try a jar & let you know how it turns out!